Don’t throw salt in your winter weather woes! With the temperatures dropping, snow and ice have come to the area, which pose threats not only to driving conditions, but your wardrobe as well. 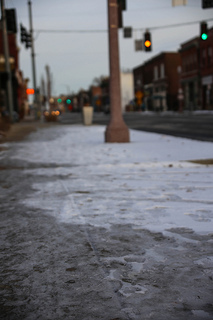 The salt used to deice roads and sidewalks tends to be harmful to your clothing. So we’ve compiled a few tips to keep your season full of color even during a white out. Salt has a tendency to rapidly set in clothing, especially the rock salt used for deicing. If salt sets in, not only will colors fade, but also the general durability of your clothes will greatly diminish. Dust off/remove excess salt; if the salt has already dried, use a soft-haired brush. Dab stain with warm water. Air-dry and again, remove extracted salt. More sensitive fabrics like leather and suede can be a daunting task as time will be a crucial factor when trying to remove salt stains. The same rules should be followed as with cleaning any material, but the amount of water used should be sparing in comparison with fabrics like cotton and linens. Continually blot the spot with warm water until it is clean. We know that removing salt can be an extremely difficult process, especially once the salt has set in. For those who are skeptical about undertaking the project on their own, search for the NJ Laundromats location near you. We’ll be happy to give you a hand.